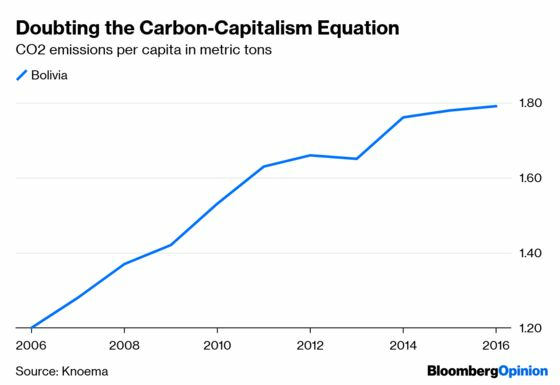 (Bloomberg Opinion) -- It has become fashionable on social media and in certain publications to argue that capitalism is killing the planet. Even renowned investor Jeremy Grantham, hardly a radical, made that assertion last year. The basic idea is that the profit motive drives the private sector to spew carbon into the air with reckless abandon. Though many economists and some climate activists believe that the problem is best addressed by modifying market incentives with a carbon tax, many activists believe that the problem can’t be addressed without rebuilding the economy along centrally planned lines. Recent developments show that the technology-centered approach can work. A recent report by Bloomberg New Energy Finance analyzed about 7000 projects in 46 countries, and found that large drops in the cost of solar power from photovoltaic systems, wind power and lithium-ion batteries have made utility-scale renewable electricity competitive with fossil fuels. A 76 percent decline in the cost of energy for short-term battery storage since 2012 is especially important. Electricity is far from the only source of carbon emissions — there’s also transportation, manufacturing (especially of steel and cement), home and office heating, and agriculture to worry about. But the rapid advance of solar technology is a huge victory in the struggle against climate change, because it will allow people all over the world to have electricity without cooking the planet.